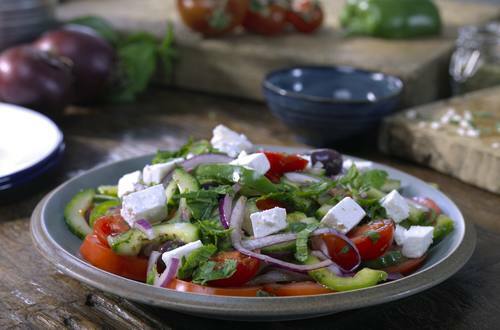 1 Make the salad by adding the cucumber, tomatoes, red onion, olives, green pepper and freshly chopped mint, before mixing well, ensuring all the dressing is covering the salad. 2 Cut the beef tomato into 1 cm slices and place on serving plate. Add a generous drizzle of Hellmann's Fat Free Vinaigrette, and top with feta cheese cubes and some extra chopped mint leaves.